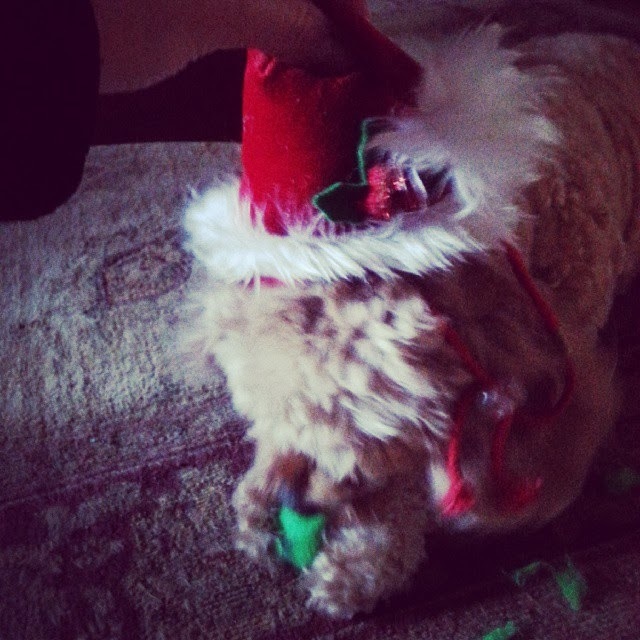 Kittle wearing a Santa hat. 2. I love sending out Christmas notes this time of the year. This is the first year, I will be writing a card to a few family members/close family friends. 3. Christmas movies are the best escape from busyness. The Grinch, Home Alone 1, and Family Stone are my favorites! 4. I enjoy baking cookies with friends and family. I baked yesterday with my sister-in-law, Tracie, and had an awesome time baking and talking. 6. I love that everyone is in the spirit of giving as well. I love hearing stories about people reaching out to others in need. 7. I love attending the Christmas Eve service. We've gone in the past, and it's always nice. 9. My favorite thing? I love spending quality time with my family including Bill's family and celebrating God sending his son. I'm very thankful.